Free download the best HD video converter to convert any video for ZEN supported ones, or extract audio from video for ZEN. 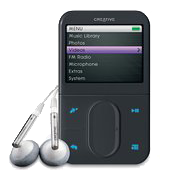 The Creative ZEN (formerly known as Creative NOMAD Jukebox Zen) is a range of digital audio players (DAPs)and portable media players (PMPs) made by Creative Technology. The players evolved from the now-defunct NOMAD brand through the NOMAD Jukebox series. Three of its players won the Best of CES award from 2004 to 2006 in their respective categories, with one winning the overall award. The ZEN series has a strong foothold in Asian markets, especially in Singapore, the company's headquarters. All players are compatible with MP3 and WMA, while various models support WAV and Audible files. They are bundled with device drivers and Creative MediaSource, a media player that includes transferring and syncing abilities exclusively for the players. Some models are PlaysForSure-certified for being compatible with Windows Media Player via Media Transfer Protocol (MTP) and supporting the Janus DRM. They are natively compatible with Windows, while the current players exclusively support Windows XP and Vista. ZEN X-Fi Style: The release of the ZEN X-Fi Style series was announced on April 8, 2010. It was created as a more affordable version of the X-Fi2, with removed Wi-Fi capability and touchscreen. The X-Fi Style comes in capacities of 8, 16, and 32GB. The player features a 2.4-inch display, video out, X-Fi technology, a built-in speaker, FM radio, alarm clock, calendar and voice recorder. ZEN Style 100/300: The ZEN Style series was announced at the same time as the X-Fi Style. The series is available in 4, 8, and 16GB capacities. Both the 100 and 300 models have the same portrait design similar to Creative's ZEN Mozaic, as well as the same sized screen as the Mozaic, at 1.8-inches. ZEN X-Fi2: The ZEN X-Fi2, announced September 2, 2009 is a feature update to the X-Fi. It includes many features of the X-Fi, including flash memory, X-Fi audio enhancements, and expandable memory. However, there are several notable differences between the two. The X-Fi2 features a full touchscreen user input mode, unlike the original's keypad-esque input method. Zen X-Fi 2: The ZEN MX is a derivative of the ZEN, released in 2009. It shares the same form factor as the ZEN, but a few cosmetic changes in addition to a few changes in firmware resulted in a fairly stripped down, and thus cheaper retailing version of the player. ZEN Mozaic: The ZEN Mozaic is a flash player that was released on August 3, 2008, in capacities of 2, 4, 8, and 16 GB. The Mozaic features a 1.8-inch video screen, a keypad that resembles a mosaic pattern, and a built-in speaker (also in a mosaic pattern). It also includes features such as a built-in FM radio, and picture viewer. ZEN X-Fi: The ZEN X-Fi was officially confirmed on July 10, 2008. The player's design is based on the ZEN and includes new features such as X-Fi technology, Wi-Fi, and online chat. The package includes a set of EP-830 headphones, and a built in speaker. It also supports wireless media streaming from a home network, similar to a Windows Media Center Extender. Convert MKV to iPad - Easiest Way to Play MKV on iPad. Download ShowBox for iPad - How to Download ShowBox for iPad mini, iPad Air, iPad Pro without Jailbreak? Apple iPad - With 9.7 inch touch screen, it does things no tablet PC, netbook, or e-reader could.